I was about to mention sst20 have good throw.. this light is a little beast..
I’m not sure if it throws farther in the ROT66, or just in the GT-Mini. Regardless, the ROT66 isn’t a throwy light no matter which emitters it uses. As a side note, looking at Vinh’s throw numbers, everything looks about 30% to 40% higher than it should be. I’d suggest multiplying those by about 0.75 to get more accurate numbers. Vinh’s numbers are a bit higher than measured with Maukka’s calibration but I think 0.75 is a bit much. I think I measured about 1,200 on my XP-L HI 4000k version and others measure 1,2xx lumens with the XP-L 5000k or 6500k version. Vinh measured 1,300 lumens on the 6,500k version. Edit: Oh sorry you mean throw numbers not lumen numbers. Yeah. The GT-Mini with XP-L HI gets about 120 to 130 kcd, not 170 kcd. And I’ve noticed similar differences on other lights. Anyway, the ROT66 seems to work pretty well with SST20 emitters. I still prefer 219B though. SST-20 is like XPG2 sized die, so dedoming it should be pretty equivalent to dedomed XPG2— probably a little less throw. I can see SST-20 dedomed out-throwing the XPL HI. Once I get my SST-20 4000k with 804 filter over it from Vinh, I will vigorously compare it to the 219B version. The LH351D 4000k + 804 has a nice tint, but it’s just too floody for my tastes. Others will probably like the sheer output and wall of light kind of hotspot it produces. After cleaning the contact and carrier.. I cleaned the battery carrier with the alcohol when I tested it with the Sony. I use liionwholesale. Great prices. Recently I bought two big orders from 18650batterystore.com. They have good sale items all the time. @raven+SKV89, that’s not the problem klrman is facing. 1. The US dollar is stronger than the Canadian dollar. 2. But most importantly, lithium ion shipping is stupidly expensive in Canada. Yeah that is going to be really hard, especially to Canada. Over here in Singapore, we’d use “sensitive air” option from 3rd party forwarders to ship Li-ion from Taobao. First kilo is SGD 11, subsequent 0.5kg SGD 4. Of course to make the most out of the consolidated shipment, you can send other orders as well, eg other flashlights from other sellers, and then consolidate the shipment before forwarding it to the destination country. Don’t even think of smuggling in by trying to camoflauge the order (customer raises an order and pays for innoculous item A, ask seller to change the price, seller ships 12 × 18650s ) or mis-declaring it on the performa invoice. Both the goods warehouse and air freight carriers scan their goods very tightly nowadays. Esp after recent few years some buggers used this route to smuggle drugs. Normal goods (eg underwear, clothes, toys, kites, faucets) current prices are SGD 6 for the first kg, subsequent 0.5kg 2. For the super sensitive goods, gotta go by “sensitive sea”, eg neodymium magnets. Cheaper though, but you gotta wait for 2 weeks. And some things like processed foods are limited to 5kg, but that’s due to local regulations and limits, not the carriers or overseas (china) customs. I believe Shunfeng Express can do it too, but the cost is gonna be eye-popping. Still, probably a tad lower than DHL. Buy a new light + 6 batts, and ask for a discount? If I were a FF boss, I will give a customer 50% off the light and free 3 18650. Nah. Just offer to pay shipping for 3×18650s for the customer. That is probably going to be expensive for them to ship directly, so that is a good punishment already. Had to try it out so I broke a four pack of 30Qs into three but for some reason I can't get the battery cage with the cells inserted back into the battery tube? Is there some kind of trick to this? No matter how I try, the batteries slightly protrude width wise and there is no play to slide the cage back into the tube. I just tried my 30Qs from Banggood and Illumn. There is no way this is going in the rot66 battery tube, it's that tight. I tried to force it a little and now the top side of on of the 30Qs has cut through the wrapping. This would probably explain why they were shipped without batteries on mine. It was upside down inside mine when it arrived. Had to try it out so I broke a four pack of 30Qs into three but for some reason I can’t get the battery cage with the cells inserted back into the battery tube? Is there some kind of trick to this? No matter how I try, the batteries slightly protrude width wise and there is no play to slide the cage back into the tube. Hmm….this “issue” has also been reported in one of the Taobao user reviews i have read. Anyone? The way I see it, someone at FF sent this light to me knowing the battery tube tolerance is faulty. Too much of a coincidence that they forget the batteries and that the batteries won't even fit. I can't figure out if it is the cage or the actual tube that is the problem, but I'm thinking maybe the cage is not allowing the batteries to come close enough together to fit in the tube. The way I see it, someone at FF sent this light to me knowing the battery tube tolerance is faulty. Too much of a coincidence that they forget the batteries and that the batteries won’t even fit. 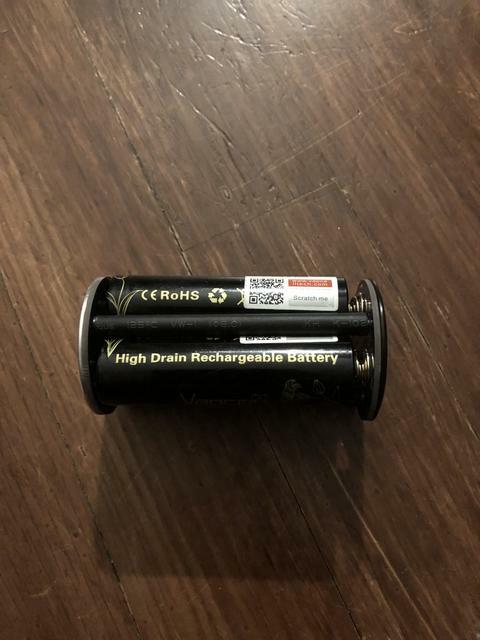 I can’t figure out if it is the cage or the actual tube that is the problem, but I’m thinking maybe the cage is not allowing the batteries to come close enough together to fit in the tube. Try sliding the batteries in without the cage. On the plus side, maybe FF can send a replacement battery tube with batteries inside. They just need to toss some aluminum caps on both ends and it will be sealed really well for shipping. Sorry, I missed that. No problem, slides in smoothly without the cage. I thought about loosening the cage screws, but then that really isn't a good idea either. I thought about that, but having some screws loose doesn't seem like it would be good to do. Ok, maybe not a bad idea after all. I put the cage under a strong light and I can see some of the cage tubes warping inwards, which would be enough to not all the batteries to sit tight with each other. Going to unscrew and rotate them to see if I can get a tighter fit. It is hard to explain.. hold the right side of the carrier and hold the left side of the carrier at the same time.. both sides must able to move or twist.. I observed 2 black pole should be tight and one black pole should loose freely..
You can adjust it using your hand.. can you try that method? Sorry, I missed that. No problem, slides in smoothly without the cage. I thought about loosening the cage screws, but then that really isn’t a good idea either. Okay, then that means the cage is not letting the batteries touch each other. The battery tube seems to be okay. It’s something with the carrier. Try shining a light to see if you can get the batteries all touching side by side. I think you are on the right track. I observed 2 black pole should be tight and one black pole should loose freely.. You can adjust it using your hand.. can you try that method? Wow is it ever bright. This little light is blinding with the xpl hi. Okay, then that means the cage is not letting the batteries touch each other. The battery tube seems to be okay. It's something with the carrier. Try shining a light to see if you can get the batteries all touching side by side. I think you are on the right track. Yes, thanks, it finally worked out in the end. As Newlumen said, one of the three poles needs to rotate freely in order to let the batteries come tight together. They should really make sure these things are done at the factory before letting them out the door. Oh well, learned something new and valuable today so it's a good thing. Glad that issue was sorted out……just a bit of adjustment to the carrier, shdn’t be too difficult for flashaholics. This light is in my to-buy list, even though i generally don’t like pocket rockets with the small mass coz of the year round hot weather here. I learnt it the hard way last time.